The Barça Legends, in Kolkata, India ahead of Friday’s match against local outfit Mohun Bagan AC Legends, helped inaugurate a youth football tournament there while continuing to get acclimated to the high heat and humidity. Kickoff of Friday’s match is at 7.00pm local time. 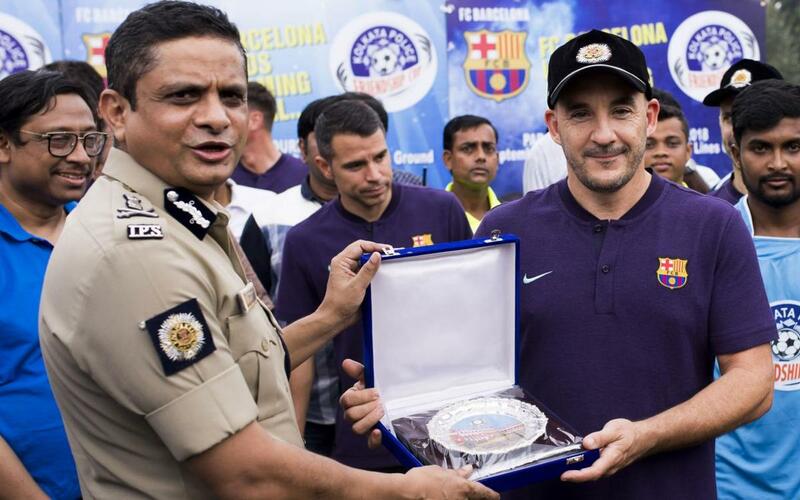 But before the week’s main event, the Barça Legends, managed by Albert ‘Chapi’ Ferrer, were at Kolkata Police headquarters with Kolkata Mayor Sovan Chatterjee and Kolkata Police Commissioner Virendra to officially kick off the tournament, which has been held annually since 1997 and which brings together some 700 teams and more that 15,000 children from around the city. The tournament, which is organized by the Kolkata Police Department, aims to use football to keep children off the streets and keep them from resorting to crime or getting involved in drugs in a city of more than 10 million inhabitants, in which citizen safety is a big problem. Following lunch with the heads of the Kolkata Police Department, the Barça Legends went to their hotel, and before heading out to train, Ferrer and the Legends José Edmilson, Juliano Belletti and Javier Saviola appeared at a pre-game press-conference. One of the day’s overall highlights was the large presence of Barça fans in a country where Cricket is the most popular sport. The Barça Legends are just one of the ways the Club can gauge its popularity in India, where FC Barcelona already has two Barça Academies — in Delhi and Mumbai — with a third opening soon.